England's years of living down to expectations are over - now the difficult part will be keeping a lid on the rising hopes and anticipation surrounding Gareth Southgate's exciting young side. The euphoria of a surprise run to the World Cup semi-finals in Russia was tempered by the sense of a missed opportunity after they were beaten in extra time by Croatia in Moscow and failed to reach their first final for 52 years. As Wembley rose in unison at the end of this emphatic 5-0 thrashing of the Czech Republic there was the sense that Russia was simply the start of something very special for England and this emerging generation of players. The Czech Republic were compliant opponents, barely offering a threat and with several accidents waiting to happen in defence - which duly occurred. England were ruthless and dynamic. They were simply too fast, too mobile, too good - and no-one should pour cold water on that. 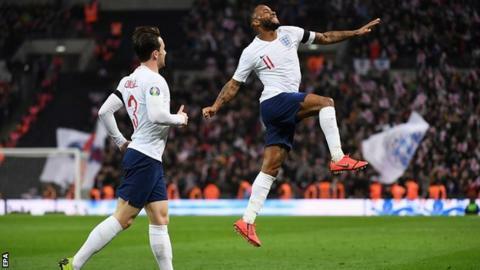 And after their advance to the final stages of the inaugural Nations League in Portugal in June, secured by their first win in Spain in 31 years and a superb comeback to exact revenge over Croatia at Wembley, there is every reason to believe this England team is not just here to stay, it is going to get better. It was crucial England capitalised on the wave of goodwill that accompanied them back from Russia. The nation loved their football team again and momentum needed to be maintained. It has not simply been maintained. It has been gained. And at the head of it all was Manchester City's Raheem Sterling, now the mature, high-class player everyone assumed he would become when he first demonstrated his brilliance at Liverpool. Sterling, still only 24, has become the complete forward under Pep Guardiola's guidance at City. Southgate's careful handling and support during much of a three-year spell in which he never scored an England goal in 27 games is now reaping its reward. Southgate never wavered. He insisted he could not understand questions about Sterling's place in England's side. They were not words to bolster fragile confidence. They were delivered with conviction and belief. Sterling now has 24 goals for club and country this season. He is flourishing in the Premier League, Champions League and with England. He is naturally gifted but now more clinical - and there is more to come. This is a message that applies to this England side, a team now confident in itself and with the growing confidence of supporters who became accustomed to bitter disappointment. As recently as 2016, they were bundled out of the Euros by Iceland in the last 16 under Roy Hodgson's management. England's first goal against the Czechs summed up their fluidity, confidence and cutting edge. It was a passage of 25 passes in which only Dele Alli did not touch the ball. Even goalkeeper Jordan Pickford was involved before the final thrust from Harry Kane's clever pass inside the defence, Jadon Sancho's perfect cross and Sterling's sliding finish. Kane has now scored 16 goals under Southgate, 11 more than any other player. Sterling is another who is among the first names on the manager's teamsheet. What adds to the excitement is the lengthening undercard of young, precocious talent with the confidence to not simply stand alongside their more experienced, established England team-mates but to push them for their places. England's evolution has picked up pace rapidly since the World Cup - which was crucial - and the evidence of future potential was paraded before elated fans at Wembley. Sancho, just 18, wore the England shirt that used to weigh so heavily on so many before him like it was a perfect fit. If anything, the Borussia Dortmund youngster was almost too confident, too eager early on before all of his burgeoning talent came to the fore. Sancho had the vision and composure to play in Sterling for the first, then brought England's fans to their feet with two quick-fire pieces of sleight of foot in the Czech penalty area. And the substitute appearances of 20-year-old Declan Rice and Chelsea's Callum Hudson-Odoi - the youngest player to make his debut for England in a competitive international, aged just 18 years and 135 days - gave another tantalising glimpse into the future. It was the first time in 138 years that England had fielded two players aged 18 or younger (Sancho and Hudson-Odoi) in an international. Southgate's own boldness deserves credit here. It is hard to imagine any of his predecessors thrusting a rookie such as Hudson-Odoi into his England debut before he had even made his first Premier League start at Chelsea. This is another sign that the emphasis has changed around England. And with the likes of Liverpool's Trent-Alexander Arnold and Joe Gomez, Manchester United's Marcus Rashford, Jesse Lingard and Luke Shaw and Manchester City's John Stones to come back from injury - plus midfield quality in the shape of Southampton's James Ward-Prowse and Leicester City's James Maddison - there will be some very hot competition for places to add to England's edge. England look a team perfectly equipped for the modern game in attack with pace, mobility and threat. The midfield has yet to pass the stiffest tests but Rice's switch from the Republic of Ireland may provide the missing link in that department. The same questions can be applied to England's defence in the face of this flimsy Czech Republic side but this was not a night for quibbling or negativity. This was a night when England delivered on the hype. They are now unbeaten in their past 40 qualifying matches in the World Cup and Euros, winning 31 and drawing nine since a 1-0 loss to Ukraine in October 2009 - but rarely in that sequence has there been the sort of hope and optimism that surrounds this group of players. Now the good work must continue when England face Montenegro in Podgorica on Monday.